Purchased for Engagement Party. Used as wall decor and not on chairs. Looked beautiful - theme was black and gold. Bought this in silver for my daughter's elegant winter wedding. Used it on the chairs exactly as pictured. It was perfect! Would highly recommend. I bought these for my wedding and they are beautiful. I inserted the strings but we cant figure out how to successfully hang them on the chairs. How are they hung in the example picture? A:Have you tried looking the string around the sign? 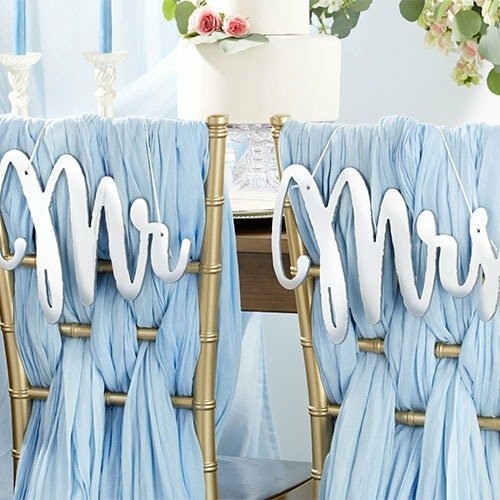 On your wedding day, details matter and this Mr. and Mrs. chair sign proves just that. This elegant and attractive chair sign shows off to guests your careful attention to details. With its pretty coloring, fanciful font, and nod to romance, you'll be sitting high all night.